Although the GOP leader Michael Steele appears to have survived his latest gaffe, there are suggestions from some in his party he needs to resign his post as GOP leader. Suggestions are Sarah Palin should replace him. I wonder how long she’d stay? She’s not proven her dedication to anything other than her own self promotion. 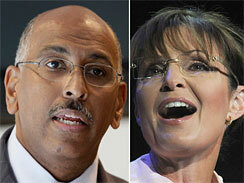 This entry was posted in Opinions and tagged GOP Leader, GOP party, Michael Steele, Sarah Palin. Bookmark the permalink.